Traveleurope Milan hotel reservation service provides you with a wide variety of lodging and hotel options, from cheap hotels to luxury accommodation in Milan near Viale Certosa. Quick and easy hotel reservations with instant confirmation and great value for money whether you travel for business or tourism. Select travel dates and find all available hotels in Milan - Viale Certosa, check out guests reviews and locate properties on Milan city maps, book your favourite accommodation with no pre-payment. All rates are in Euros and inclusive of all taxes. 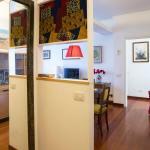 Located near FieraMilanoCity, Hotel Mirage is ideal for leisure or business stays. This elegant 4 star hotel offers easy access to Central Station and Cadorna station as well as the airports of Linate and Malpensa. In a strategic position near the stadium Meazza, between the centre of Milan and the Rho Pero fairgrounds, you can stay in the cozy Hotel Bel Sit, easily accessible by highway or by public transport.